Did you know that the leading cause of death in the United States for men and women is heart disease? According to the American Heart Association, heart and blood disease claims nearly one million Americans each year. Do you smoke? If so, you more than double your risk of heart disease. Also, smokers who have a heart attack are more likely to suddenly (within an hour) than nonsmokers. Obviously, it makes sense to stop smoking before heart disease symptoms appear. Need to shake your smoking habit? Talk with your physician about stop-smoking aids as well as checking into classes and support groups. Another motivator to stop? Think of the money you will save! If you are a nonsmoker who’s regularly exposed to cigarette smoke, your risk of having a heart attack almost doubles – so do everything you can to avoid secondhand smoke. If you are overweight, you are more likely to develop heart disease even if you don’t have any other risk factors. Carrying extra pounds can strain the heart and it can also go hand-in-hand with high blood pressure, unhealthy blood cholesterol levels, and diabetes. Need more help with managing your weight? Add more movement to your daily routine and talk with us at the Body Firm about some eating plans that could help you. The biggest problem with high blood pressure is that it usually has no symptoms so it’s important to have your blood pressure measured on a regular basis. Normal blood pressure is below 120/80. Changing some lifestyle habits such as losing weight, adding regular and brisk exercise, cutting back on salt and managing stress, can help lower blood pressure. Your physician may prescribe medication to help with elevated blood pressure. Your total blood cholesterol level should ideally be below 200. The most important number to watch is your HDL (“good”) cholesterol which should be at least 40 but 60 or higher is ideal. LDL should be below 130. A diet high in saturated and trans fat tend to raise total blood cholesterol so try to reduce animal fats, tropical and hydrogenated vegetable oils from your diet. Adding monounsaturated fats such as olive and canola oils as well as some fish can actually help improve unhealthy cholesterol levels. A fiber-rich diet and taking vitamin E and/or fish oil supplements can reduce the risk of heart attack and stroke. Make it a point to have a discussion with your physician about what you can do should you find your cholesterol levels too high. Regular exercise can greatly reduce the risk of heart disease. Just 30 minutes five days a week of brisk walking, jogging, biking, roller-blading, swimming, etc., also helps in losing/maintaining weight as well as managing stress. You have plenty of options at the Body Firm for staying active! Type 2 diabetes tends to appear in middle age and among people who are overweight and in its mild form, diabetes can go undetected. 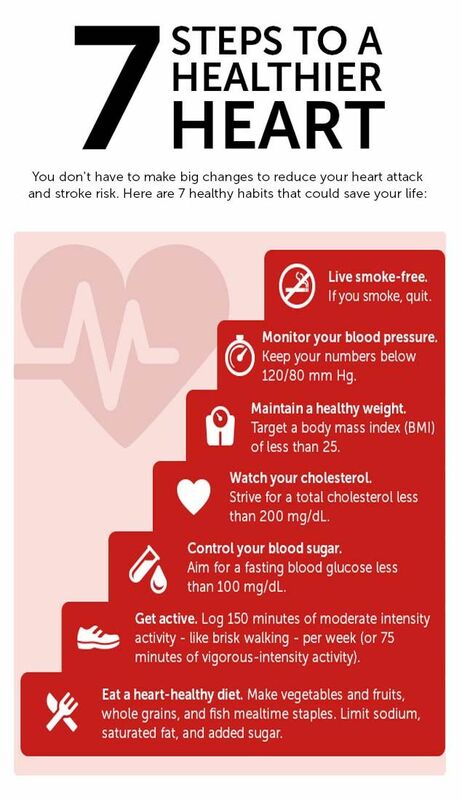 Uncontrolled diabetes greatly increases the risk of heart disease. Losing weight, eating healthily and keeping blood sugar levels under control are key. We all have it, but because we feel it in different amounts and react to it in different ways, it’s challenging to define and measure. Turning to alcohol, cigarettes, and fatty foods for stress relief will increase your heart disease risk. A better way to manage stress? Exercise (the Body Firm can help again! ), getting more sleep, or a relaxation technique like meditation is sure to bring some relief.